"we need no wings to go in search of God but have only to find a place where we can be alone and look upon God present within us." One of the distinctive attributes of The Carmelite Way is Stillness & Silence. 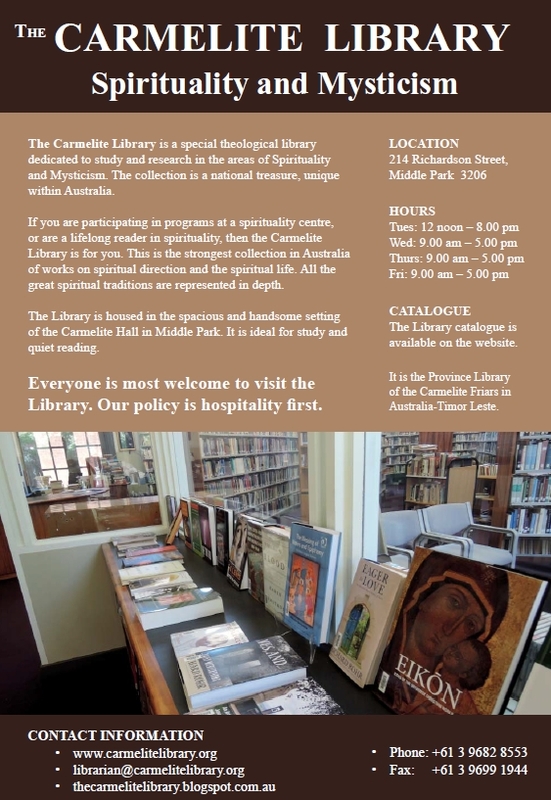 The Carmelite Centre Melbourne seeks to provide a contemplative space to facilitate spiritual journeys and personal growth with many different programs and services. Three weekly events offer an opportunity for Stillness & Silence. This Christian Meditation Program is a series of contemplative meditation sessions drawing on the Christian tradition, spiritual writing and scripture to deepen a way of being in God’s Presence. It is an invitation for all those with an open heart, who are seeking to bring unity and wholeness into daily life. Whether you come from a Christian background or have formed your own views, everyone with a belief that something greater than themselves draws them beyond themselves is welcome. – Time to transition from the world outside with music, and an introduction to the session and meditation process. – A theme around an aspect of the human condition with an invitation to hear what inspires you to form a ‘centering prayer’ guiding you into shared silence. – An opportunity to share any individual experiences with the group, if desired. Experience the benefit of meditation as a way of bringing peace, harmony and joy to your life. Meditation is a way to assist us to live a ‘mindful’ life to enhance our day-to-day awareness by living in the present moment. The Introductory Program is recommended for those new to meditation. It is for those who would like to introduce meditation into their lives in a gentle, progressive manner. It is simple and effective and avoids the disappointment that sometimes comes when people rush ‘head-long’ into advanced meditation practices. 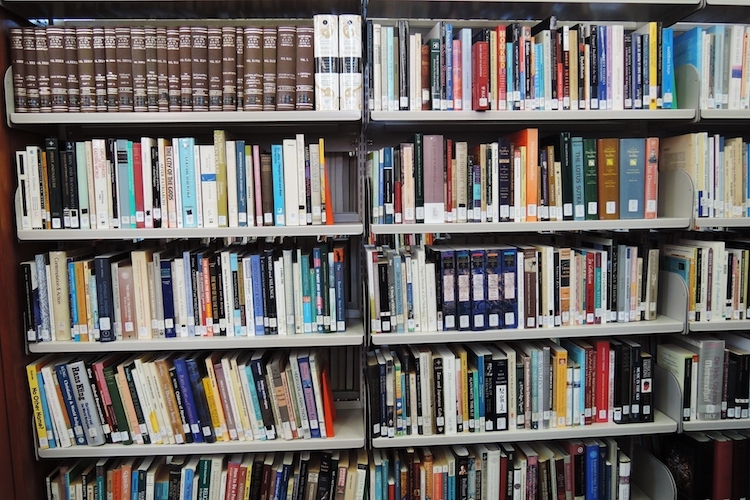 Lectio Divina, a Latin term, means “divine reading” and describes a way of reading the Scriptures whereby we gradually let go of our own agenda and open ourselves to what God wants to say to us. In the 12th century, a Carthusian monk called Guigo, described the stages which he saw as essential to the practice of Lectio Divina. Whether individually or in groups, Guigo’s description remains fundamental. A group meets each Friday morning for Lectio Divina in the Lady Chapel at Our Lady of Mt Carmel Church in Middle Park at 9.30am (after 9:00 Mass.) If you are interested and have any questions please call the Carmelite Centre on 03 9690 5430 or contact us online. Download Lectio Divina for each day of this month here. 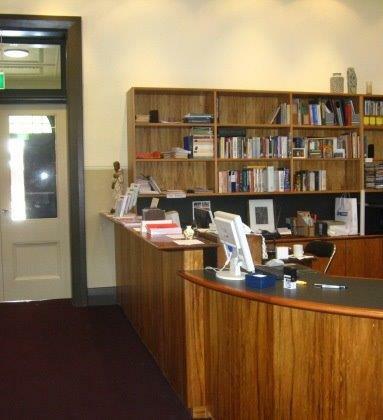 The Carmelite Centre Melbourne seeks to provide a contemplative space to facilitate spiritual journeys and personal growth. Spiritual Direction is a series of conversations about your life in the light of your faith or values. The focus is on your spiritual journey through the day to day experiences of your life. These conversations assist discernment of what is life-giving for you, and what is binding you or holding you back from becoming all you have the potential to be. With greater clarity and self-knowledge you can then choose the way forward on the spiritual journey with greater freedom. The conversation may begin with an overview of what’s going on in your life – the joys and sorrows and challenges. Through talking and listening together the broad sweep may begin to focus on a deeper level. The content of this focus may be a surprising and helpful revelation. Or the session may begin with a particular aspect of your life that you want to talk about. It’s your time so it’s up to you. 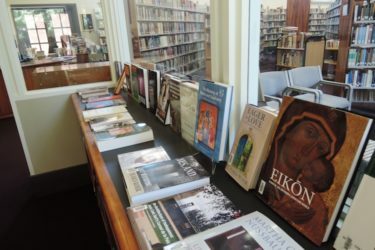 If you are interested in finding out more about Spiritual Direction or making an appointment, please contact the Carmelite Centre by calling 03 9690 5430 or email us. You will be put in touch with a Spiritual Director to arrange a suitable time to meet. When can Spiritual Direction be helpful? Spiritual Direction can be particularly helpful if you feel a need for change in your life in response to a calling to a deeper spiritual life; or feel stuck and dissatisfied in your spiritual journey; or when you are dealing with difficult circumstances; or when you feel a desire to talk at a deeper level than day-to-day conversations allow; or have a persistent yearning for a more intimate relationship with God. Speaking about what’s happening, receiving the undivided attention of another, focused on what matters to you, can in itself be most helpful, supportive and encouraging on your spiritual journey. Is Spiritual Direction different from counselling? The main focus in Spiritual Direction is your spiritual journey. The main focus of counselling is problem solving. Both deal with the concrete reality of your experience of life and both encourage deepening self-knowledge. In counselling such self-knowledge serves the purpose of dealing with the problem or on-going difficult life situation. In Spiritual Direction such self-knowledge enables greater freedom to respond to the fullness of life to which God is calling you, that is, to more fully become the unique person you are created to be. With an appropriate counsellor, counselling can certainly facilitate this journey too without being the primary focus. How are Spiritual Directors trained? The qualification of ‘Spiritual Director’ is through a Graduate Diploma which involves both theory and practice. Spiritual Directors themselves receive regular Spiritual Direction and also Professional Supervision. Who are the Spiritual Directors? Bernadette Micallef has been working as a Spiritual Director at The Carmelite Centre since 2012. She has a Bachelor of Theology and a Graduate Diploma in Spirituality (Spiritual Direction) and equivalent to a Graduate Diploma in Spirituality (Carmelite Studies). She is married with three sons (and a daughter-in-law and two grandchildren!) 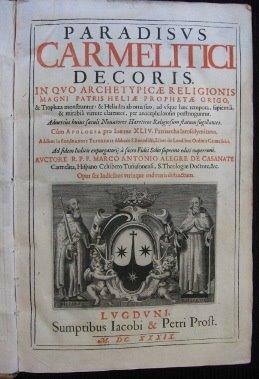 and has been a member of the Carmelite Order since 1991. Damien Peile is The Carmelite Centre Pastoral Adviser. Damien is available as a Spiritual Companion and draws on his professional qualifications in counselling and theology as well as his many years experience and commitment to supporting others on the spiritual journey. Can I get to Middle Park by public transport? No. 12 Tram from Collins St to stop 135 (on Mills Street) then 220 m walk down Richardson Street. No. 96 Tram from Bourke St to stop 129 (on Canterbury Rd) then 450 m walk down Wright Street. Approached from a contemplative stance, counselling uses spiritual practices such as silence, stillness and mindfulness to help live more fully in the present. This shifts attention away from worries about the future or depressing events from the past. The practice of silence moves from simply reacting to life to living in a more considered and heart-felt way and moving out of the whirlwind of chattering thoughts and emotions. 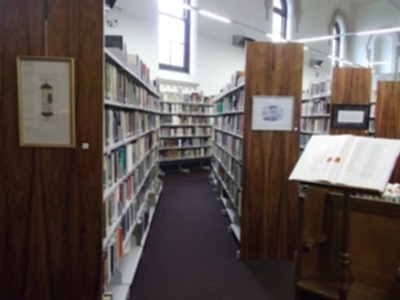 Located within the Carmelite Centre precinct the Carmelite Library of Spirituality and Mysticism provides a unique resource for students of religion, theology and spirituality throughout Australia. With its wide membership which includes graduate and post-graduate students and researchers, clergy and lay people, the library is a popular resource centre for all things spiritual. 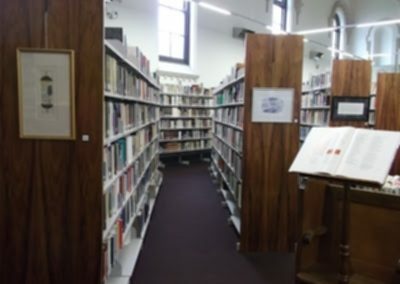 Philip Harvey (Librarian) and assistants Susan Southall and Tim Hennessy provide care and support in the Carmelite Library, home to many hundreds of books, arguably one of the largest collections of theological and spiritual books in the nation. 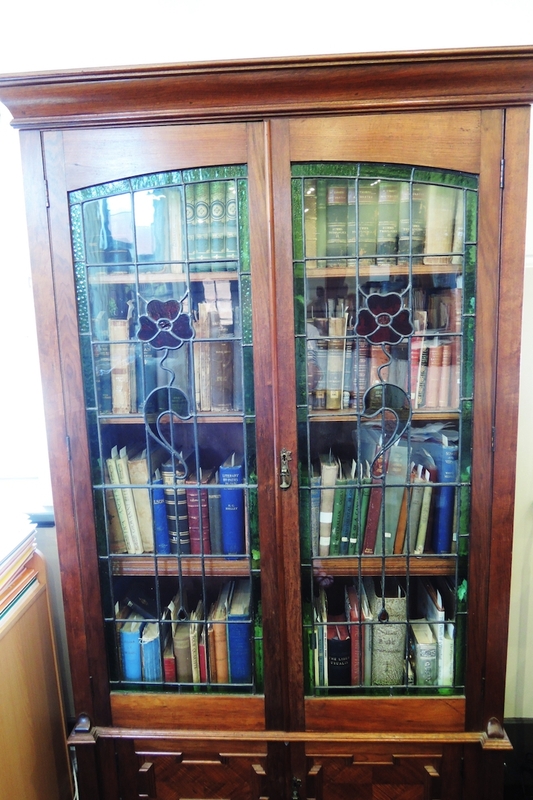 You are most welcome to visit the Library to browse. 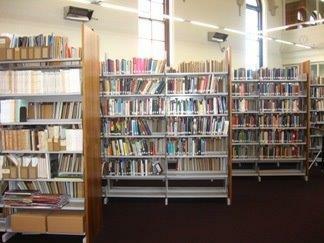 You can also become a Library member and borrow from our extensive collection. 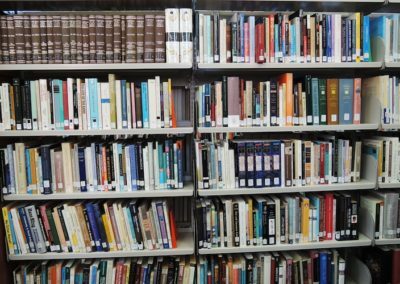 Check out the library website. 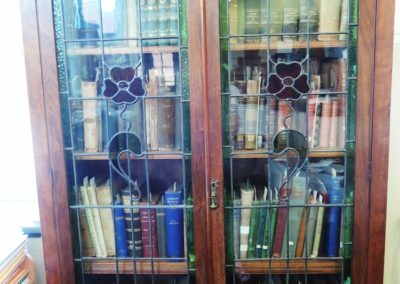 There's also a library blog. 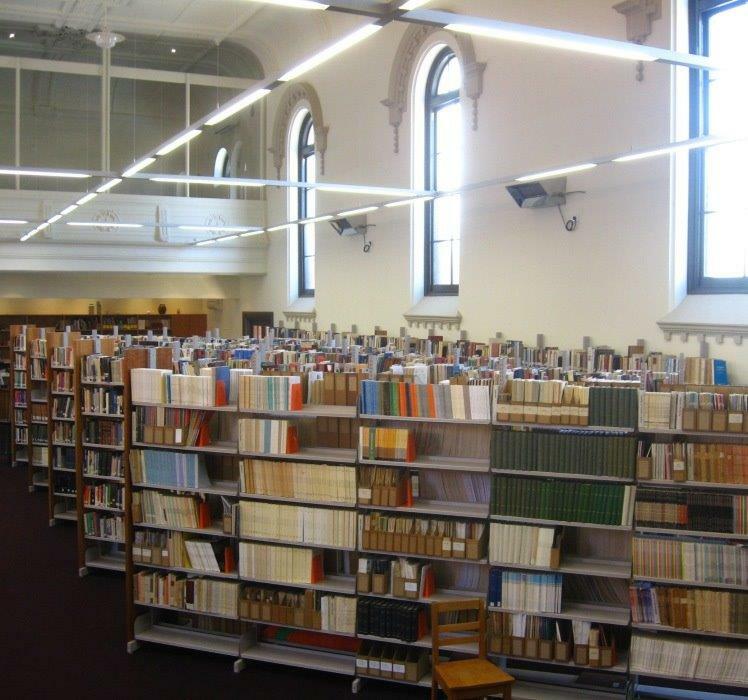 The Carmelite Library is a member of the Australian and New Zealand Theological Library Association Ltd. 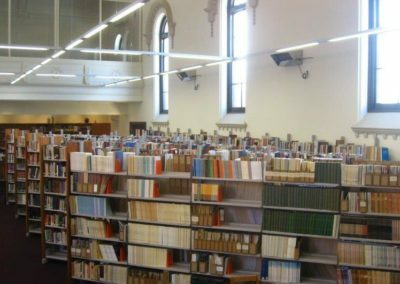 This Association seeks to foster the study of theology and religion by enhancing the development of theological and religious libraries and librarianship. 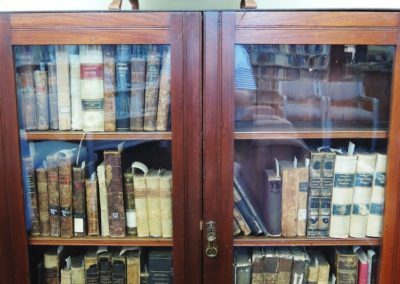 The Discovering Carmelite Certificate Programme is an initial level programme offering a foundation in various aspects of Carmelite studies. 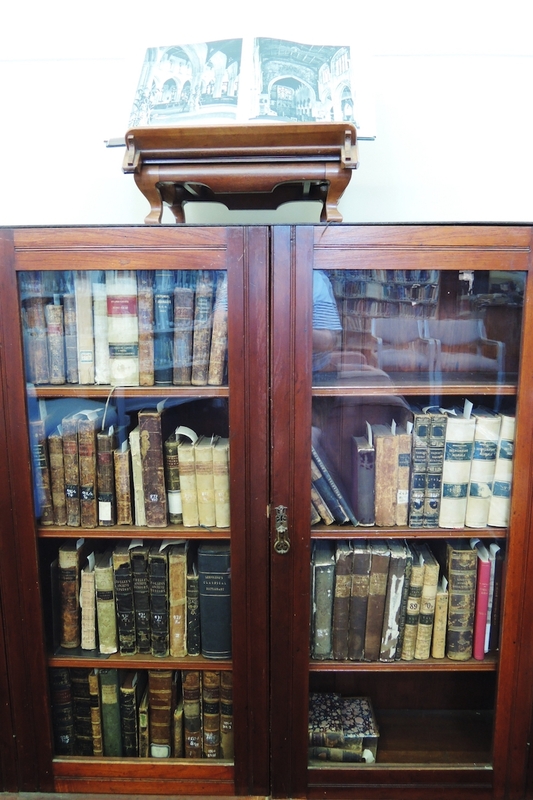 For more information, please visit the CIBI website.